Established by an Italian lady and her Goan husband, Basilico is a garden restaurant set up in a Portuguese-styled villa off a small street in Anjuna. The decor of the place has been done in Italian colors – green, white and red. The place has a romantic vibe with soft music and is perfect for those cheese-and-wine nights. Their menu is written in Italian with small description in english. The place has a quantum of options in salads, pizzas, homemade pastas, raviolis, lasagna, and calzone. The flavors are as fresh and authentic as they can get. You can see the pizzas coming out of the wood oven and filling the place with the aroma. 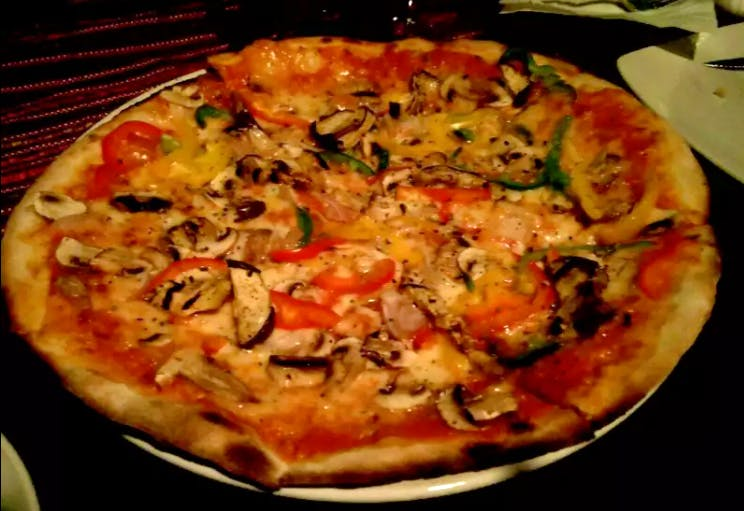 Some more popular choices of dishes are seafood pizza, aubergine and ricotta cheese pizza, sardine salad, and perfectly baked calzones. The desserts are the best part about the place. You can’t choose just one dessert to have. Their nutella crepe, creme brule, Tiramisu are heavenly.